One of the great pleasures of working at the project is our current co-operation with ISK – The International School of Kigali. Students from ISK have worked with us on Friday afternoons for more than two years now, taking part in our ‘sports Friday’ activities. This year the community outreach programme has been extended to include table games sessions with some of the younger ISK students and a very special project to make a piece of equipment to enhance the nursery school activities. Our children have no toys or books at home, perhaps making their own toys with bits of found wire, a home-made ball from leaves or plastic bags and string, or a bucket lid, nothing much else. School is mainly about learning facts by rote, never about individual creativity. Everything is decided for the students. Home is mainly about survival from day to day – cleaning, washing clothes, fetching water – everyone has something to do. And so skills of inventiveness, strategic planning, sharing and co-operation with others, dealing with winning and losing, understanding and respecting rules are in short supply. Simple things like taking care of materials and storing them, when you have never had anything are things which need to be learnt. I was very happy when Miss Pritchard suggested bringing some of the younger students to play games with the children. This works both ways, peers as teachers, cultural exchange, having fun together instead of the relentless pressure to memorise lessons for exams at the end of term. Children from both organisations learnt a lot about themselves and about each other. Yanet Grade 4 said ‘My favourite part in Take Action Tuesday is making the kids laugh because when they laugh it makes me smile. I like to make little kids happy’. Tallulah Grade 4 said ‘My favourite part was when we played UNO and JENGA and it seemed like the nursery children understood and they really liked it’. Naima Grade 4 said ‘I like seeing the smiles on their faces and they played kinda like professionals, they are really good’. On behalf of our younger children we say a big thank you to the ISK Grade 4 students – welcome any time! Our second collaborative project took place this year. Luke, Leonardo and Travis asked us if they could make something we could use in the nursery. We had a meeting to discuss the design of a play house. We had been using cardboard boxes for small group activities. We asked for a multi-purpose design which could be easily dismantled and stored away when not in use. 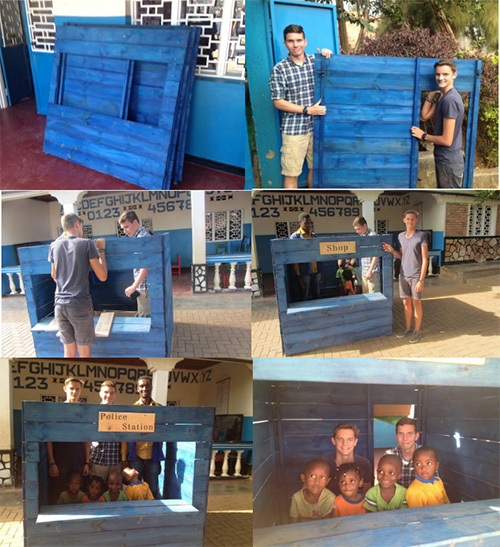 The students had to design the house, raise funds to pay for the materials and then make it. Such excitement and so many possibilities! We say a big thank you to our new friends in ISK, we will make very good use of our new house. And finally, a large group of students has been helping us on Friday afternoons with our sports activities. Not only do they bring extra hands but they bring ideas and enthusiasm for different activities. The teachers, as well as the children, look forward to Friday afternoons as everyone learns from the other. Sadly we have no photographs of the students in action on our playing field but this year our dance group was able to do something for three of them who were graduating from school. Thank you to Praneer, Ryoko, Laavanya, Ralima, Sebastian, Ronald and Masego who have given us so much this year, but especially to Sarvesh, Sabrin and Martina who are leaving us for the wider world – Good luck and thank you! We look forward to new possibilities of working together next year.